A mother of four was evicted from her home in Santa Cruz, CA, yesterday. 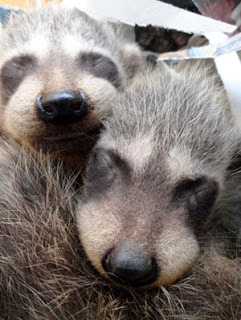 The raccoon mother had been observed under a house near Twin Lakes State Beach, in Santa Cruz. After donning protective clothing, Rebecca entered the crawlspace where the mother had been seen. She found the nest, cautiously gathered the babies into a sack, and shuttled them out. They were placed in a box insulated with newspaper to keep them warm. Next, Duane attempted to chase the mother out from under the building. It worked! 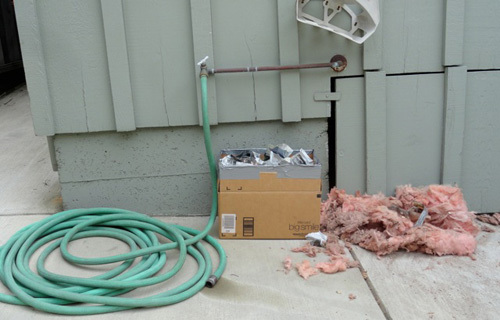 After exiting, the mother raccoon stayed nearby, hiding under the deck. Cries from her babies were used to draw her to the reunion box. One of the cubs was placed out in the open for her to retrieve - she quickly gathered up the crying infant and carried it off to another den site. 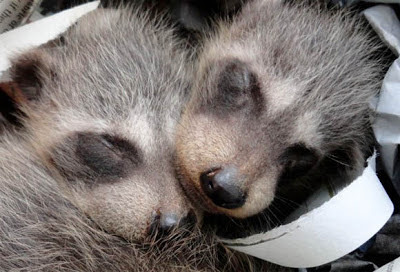 The remaining three babies were left inside the reunion box and set near where the raccoon had been entering. By early evening she had reclaimed all but one, then, sometime during the night she came back for the last one. Success. We want to thank the homeowners for calling Humane Pest Control and for allowing us to solve their wildlife problem safely and humanely. Duane Titus mounts a bird deterrent on a rooftop to discourage gulls. 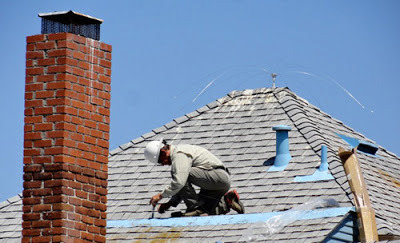 This week, Duane installed some devices on a rooftop in Pacific Grove to deter gulls from loafing and nesting there. 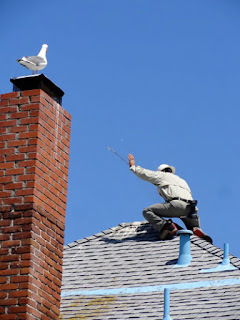 When he first climbed onto the roof, an adult Western gull landed on the chimney and watched. 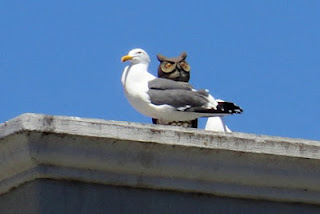 Gulls are very intelligent birds and have adapted well to urban environments. Check out THIS article on herring gulls in the UK. Gull standing next to plastic owl meant to scare them off.